Well done to the U-12 Division 1 team who captured the Division 1 League title following a 3-10 to 1-8 victory over Clann na Gael on Saturday last in Fuerty. In a very tense opening period, St Brigid’s got out the blocks quickly but a Clann goal put the side level, 1-3 apiece towards the end of the half. Brigid’s steadied themselves and went in ahead at the break five points to the good, 2-7 to 1-5. Clann did rally in the second half but our backs did tremendous work in snuffing out attack after attack. At the other end, our forwards kept the scoreboard ticking over, and outscored Clann by 1-3 to 0-3 to ensure the Division 1 title was on its way to the parish. Apart from the result, what was most pleasing was how these players have developed a brilliant understanding and their kick-passing game was a joy to watch again on Saturday. 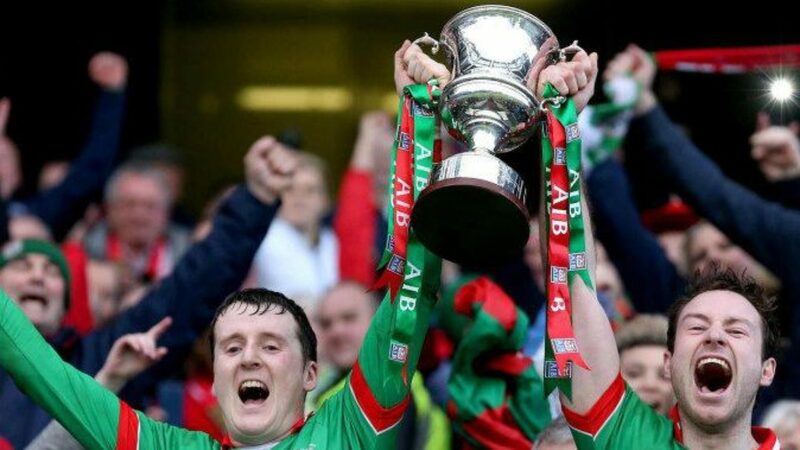 That has been no accident and down to the hard work of manager Padraig Sugrue and coaches Enda Nugent, Ronan Meeley, Johnny Doyle and Richard Canny. It’s been a fantastic year for the whole panel of players and credit to their attitude and application to training and games. They have justly reaped their rewards. As Saturday’s great victory brought the curtains down on a memorable season, the highlights being the league double, we wish all the players the very best. We have no doubt that they will all continue to develop into great players as they continue moving through the grades. The future is very bright for St Brigid’s! Team and panel: Kevin Derwin, Adam Donovan, Shane Daly (capt. ), David Dolan, Micheál Sugrue, Daniel Meeley, Thomas O’Brien, Conor Hand, Ronan Doyle, Brian Nestor (1-2, one free), Bobby Nugent (1-4, one free), Oisín Canny (0-3), Daniel Keenan. Sub used. Jamie Curley (1-1), Liam Hennelly, Matthew Samuels, Harry Griselain, James Goose, Bryan Armstrong, Martin O’Grady, Hughie Cunniffe, Eoin Reid, Paddy Higgins, James Rourke, Oran Benton, Sol Trundle, Luke Whelan, James Halpin, Daniel Skehan, Luke Murphy, Fionn McDonnell, Eanna McDonnell.